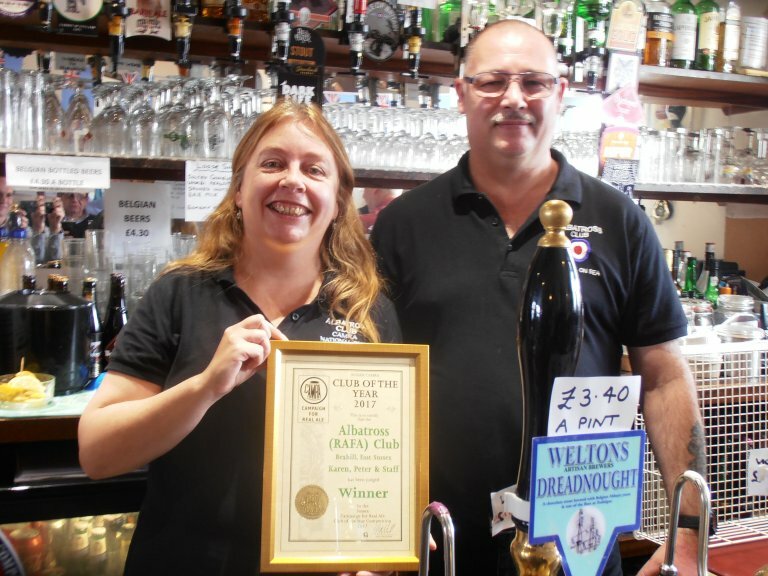 In April 2017 the first ever South East Sussex Branch award to a Wetherspoon’s pub was made to the George Hotel Hailsham, when it was voted Cider/Perry Pub of the Year. It carries a varied selection of cask ciders and perries, always offering at least four varieties. The picture shows managers Becky Dunkley and Mitch Lowe accepting the award from Branch Chair, Peter Adams, the former has since moved to become manager of the Picture Playhouse, Bexhill, which was to open later in the year. 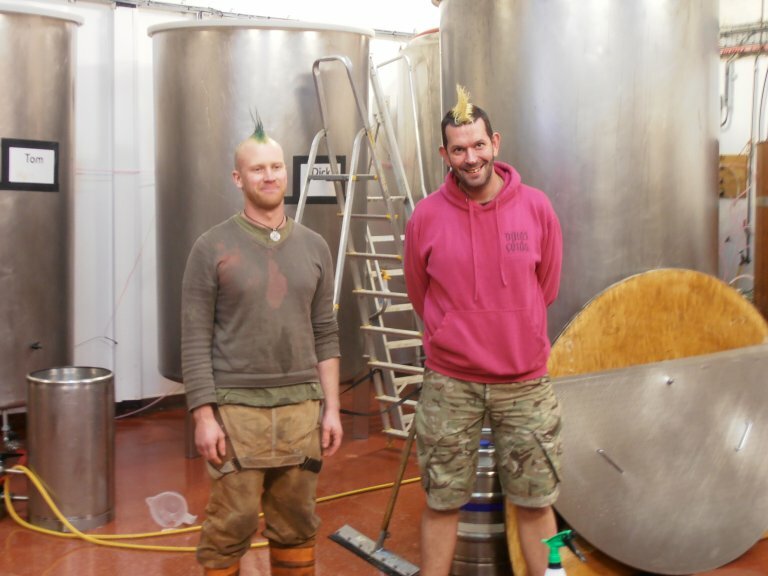 Two new Sussex brewery awards were instituted this year, one of which was presented in May 2017 to the Downlands Brewery in Small Dole in West Sussex. Throughout the year CAMRA members from this branch and others visiting from away score beers served in the branch area pubs. At the end of the year these scores are analysed in a form similar to that used to guide branch members as they select pubs for the Good Beer Guide, i.e. to qualify at least four different members will have assessed the beer on at least ten occasions. There are also agreed safeguards to avoid people unfairly favouring a particular beer or the opposite. 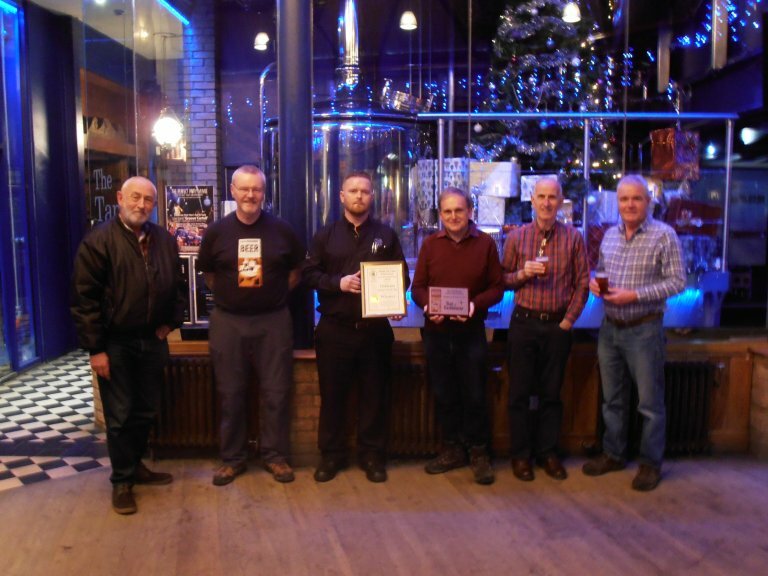 The beer which came out top of the Sussex brews was Downlands’ Black Seven-Four, and was duly awarded the Branch Sussex Beer of the Year Award at the brewery’s open day. Brewer Widdi commented that this was a real honour, as there are so many good beers in Sussex. 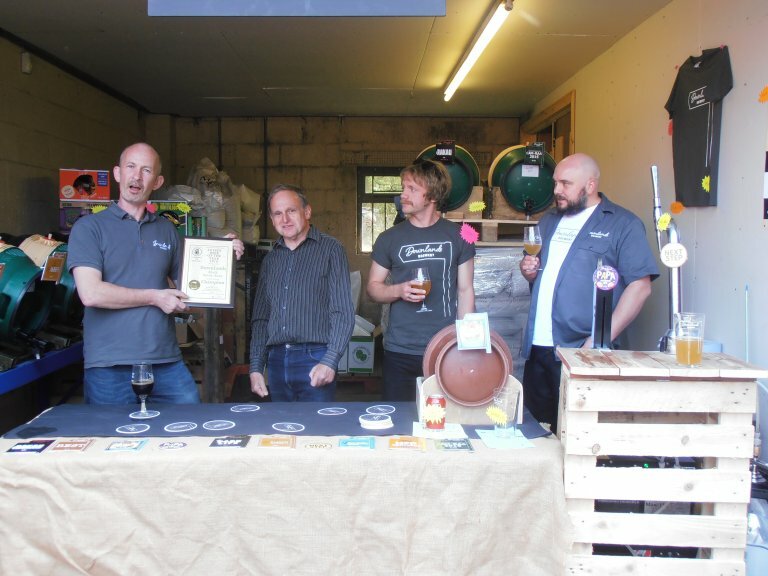 The picture shows Widdi, holding the certificate, and his colleagues, holding beer glasses, behind the temporary bar at the open day at the brewery. 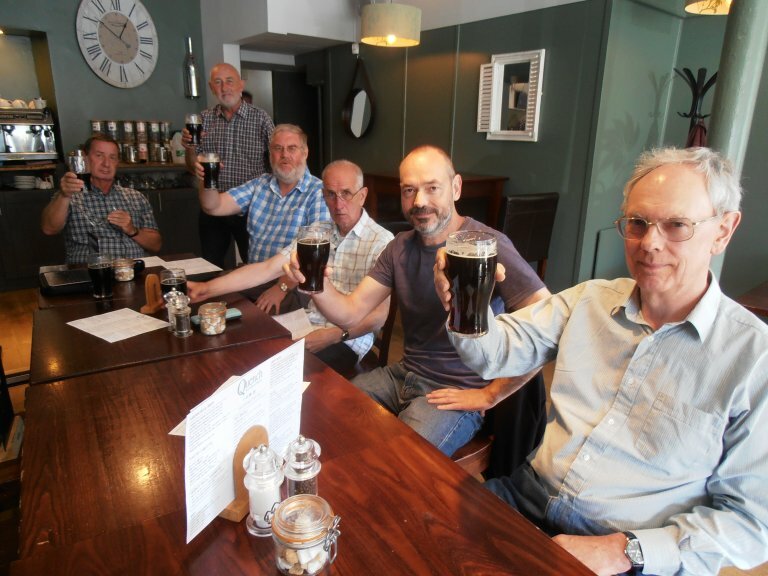 In June 2017 a number of branch members made a long awaited trip to Burgess Hill to meet up with the brewers of the Kiln Brewery in a bar, named Quench, a venue which regularly sells its beer and which ensured was stocking Bricks and Porter among others beers. This beer had won the Sussex Micro Beer of the Festival Award at the 2016 Eastbourne festival in the brewery’s début appearance at the festival. After the presentation to Andy and Craig and an enjoyable lunchtime in the bar as shown in the pictures, members were generously provided with complimentary bottles of the beer to take away. As they had to change trains at Haywards Heath on the way home, this gave an opportunity for what was for most a first visit to the newish Dark Star pub just up from the station, an enjoyable end to an excellent day. 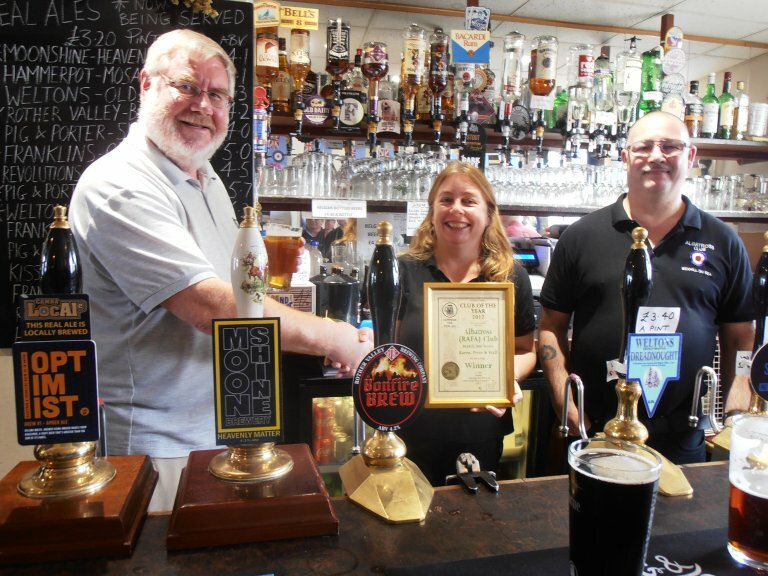 Every June the Branch makes its top pub award, the Pub of the Year, decided after detailed assessment of a shortlist of nominated pubs, using the CAMRA pub of the year scoring system. This has a number of factors assessed by members, who for their results to qualify towards the result must submit scores for each of the nominated pubs. For an unprecedented third consecutive year in 2017 the Tower in St. Leonards won the award, ensuring that the title stayed in the Hastings & St. Leonards Borough for the fifth consecutive year. 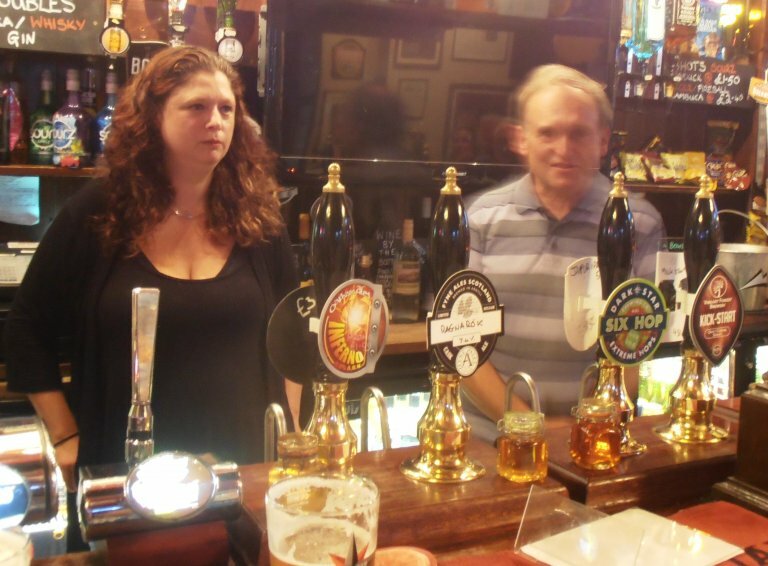 Landlady Louisa, pictured listening carefully to praise, stepped back behind her bar from maternity leave to accept the award, telling the enthusiastic assembled regulars and CAMRA members how pleased she was with three years, echoed loudly by the regulars. 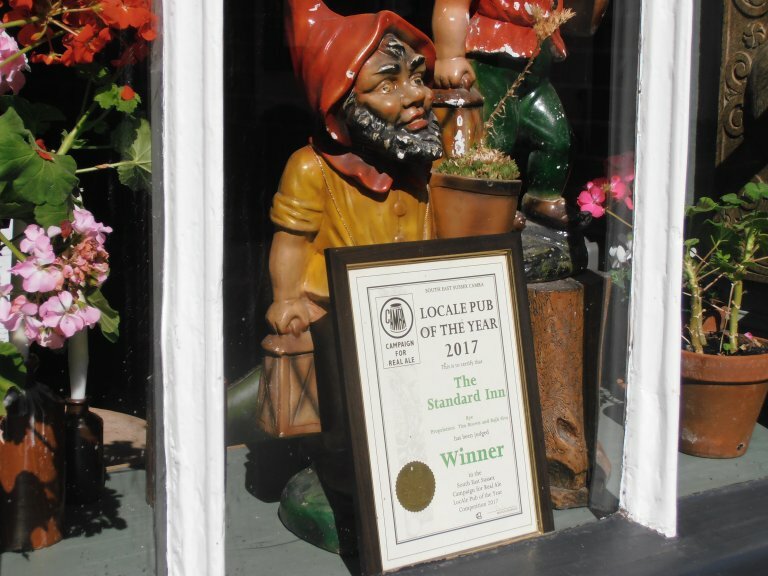 Rapidly gaining a reputation for high quality local beer, the Standard Inn in Rye was visited by members in July 2017 for the presentation of the LocAle Pub of the Year in July. 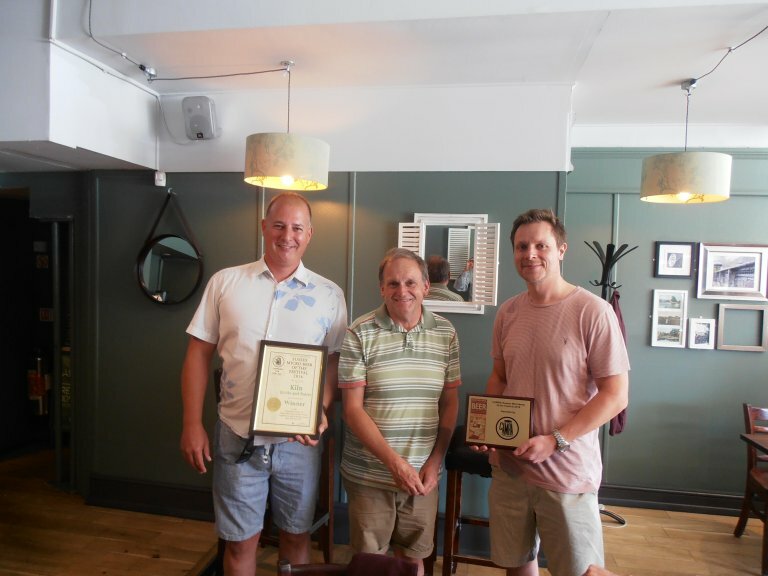 This is awarded to the pub with the best selection of beers brewed less than 35 miles from the point of sale and in the case of business partners Rajh and Tim, was a fitting award, as it was just what they set out to do when they reopened the pub towards the end of 2014. We were delighted with their appreciation when in the unavoidable absence of the Branch Chair and Vice Chair, Area Organiser and previous Chairman, Peter Page-Mitchell made the award, pictured in between the two owners. 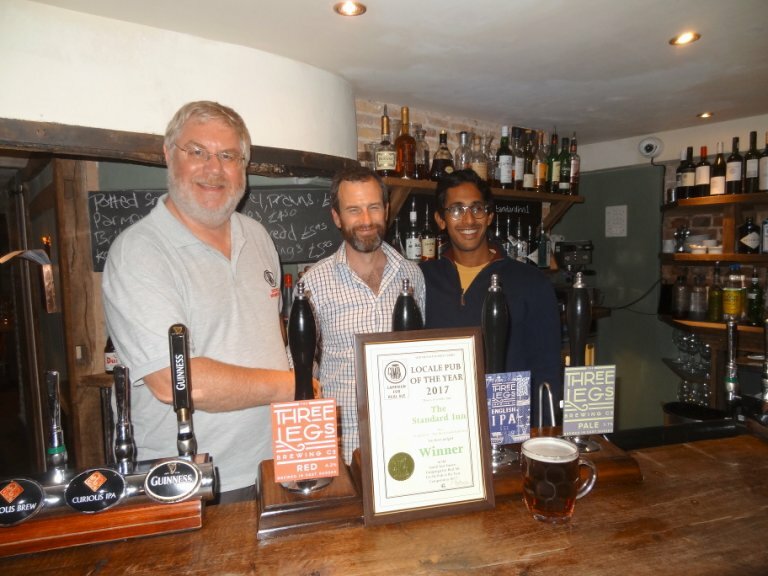 Later visits found the framed certificate displayed in pride of place in the front window of the pub, where it was pictured on a return visit in September when the pub was unveiled as being in the 2018 Good Beer Guide for the first time since 1990. Rajh and Tim were equally proud of this achievement and are pictured with their copy of the Guide. The pub is a 15th century gem situated in The Mint, in the heart of Rye's citadel, apart from local microbrewery ales it offers high quality meals and comfortable accommodation in five B&B rooms. 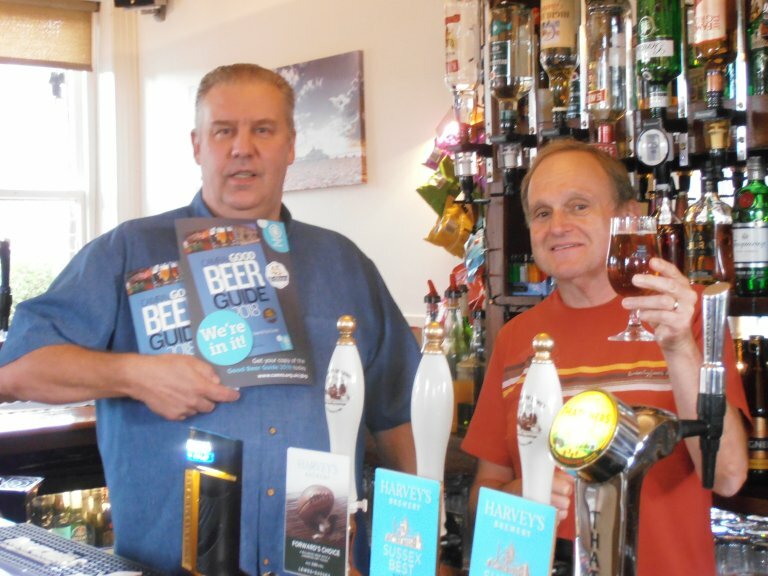 Also in July 2017 a branch visit to the Victoria Hotel, Eastbourne, was made to mark the achievement of ten consecutive years in the Good Beer Guide when it made its appearance in the 2017 edition. The picture shows proprietors Garry and Ros receiving their award. 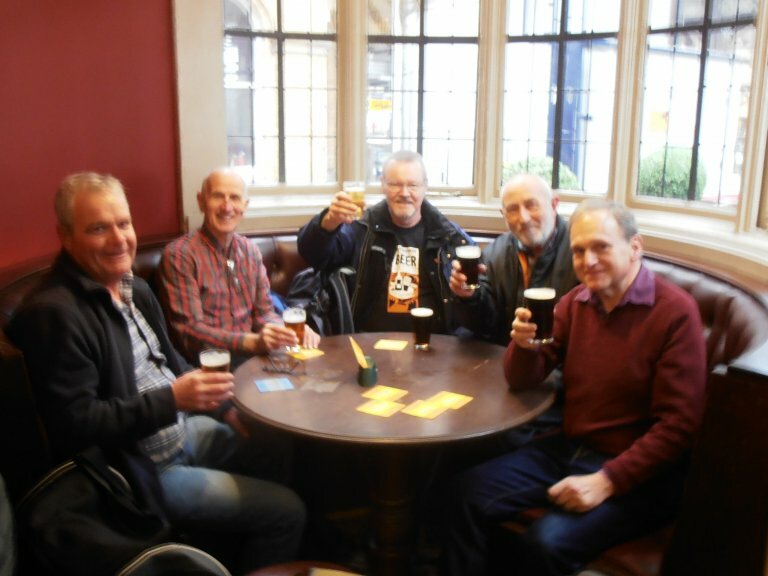 During this period there are memories of when the National CAMRA Members’ Weekend was held in Eastbourne in 2009. Such was the popularity of the pub and its Harvey’s ales amongst the visiting members from around the country that the pub ran out of beer and emergency supplies had to be obtained from Harvey’s. Fortunately the brewery had been on stand by for just such an event. 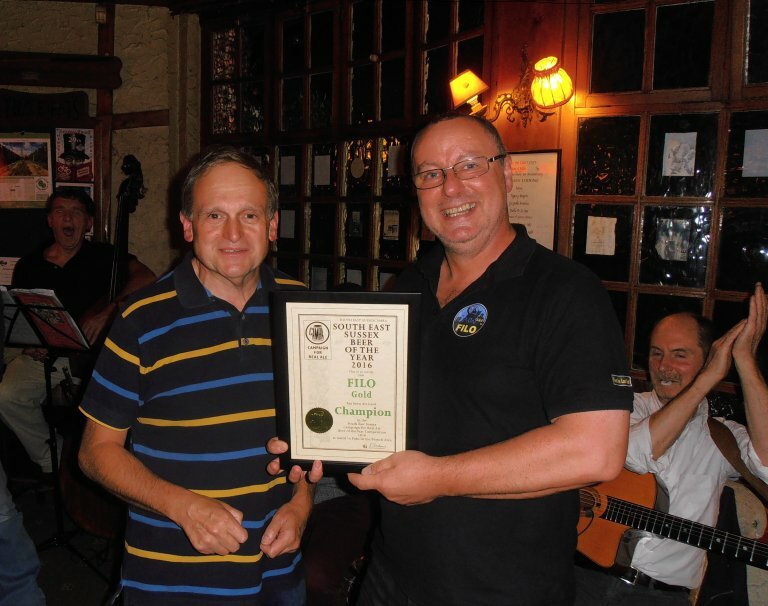 In September 2017 the other new award mentioned above (in May), the South East Sussex Beer of the Year presentation was made to the First In Last Out (FILO) Brewery in Hastings. This is judged in the same way as the aforementioned Sussex award and honours the top beer brewed and drunk in the South East Sussex pubs and for 2016 FILO’s Gold came out highest. A break in the live musical entertainment in the FILO pub was deemed the moment to hand over the award, as pictured. 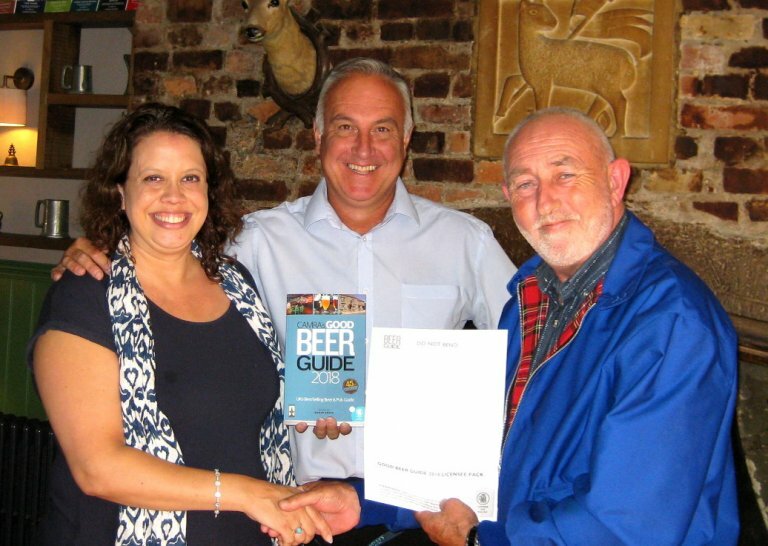 September is a busy month for CAMRA members visiting pubs bearing ‘gifts’, as the notifications for the following year’s Good Beer Guide are distributed. In addition, in September 2017, two different awards were made on the same evening to two Eastbourne pubs. The Crown in the Old Town was the Runner Up to the Tower, (as mentioned above), in the Branch Pub of the Year competition, having been the ‘unannounced’ third in 2016. 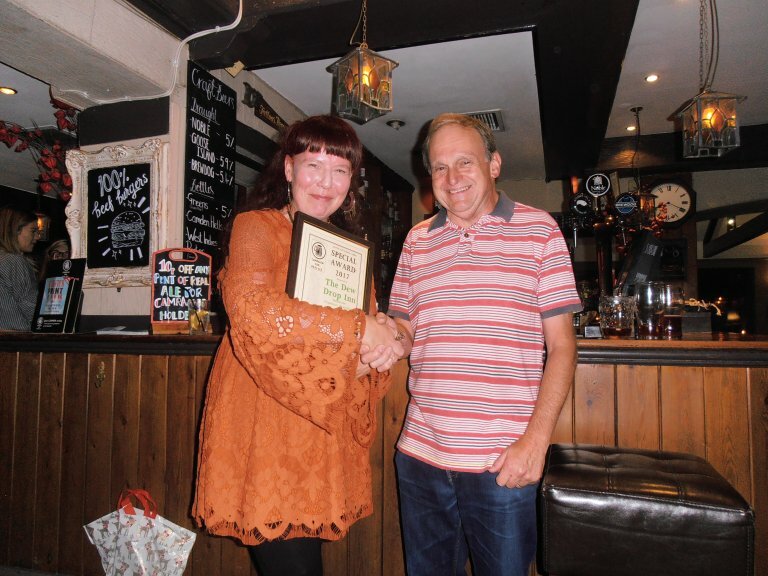 This was the third CAMRA award and highest to date made to Andy and Jo since they took over the pub, the picture shows Andy receiving the award. 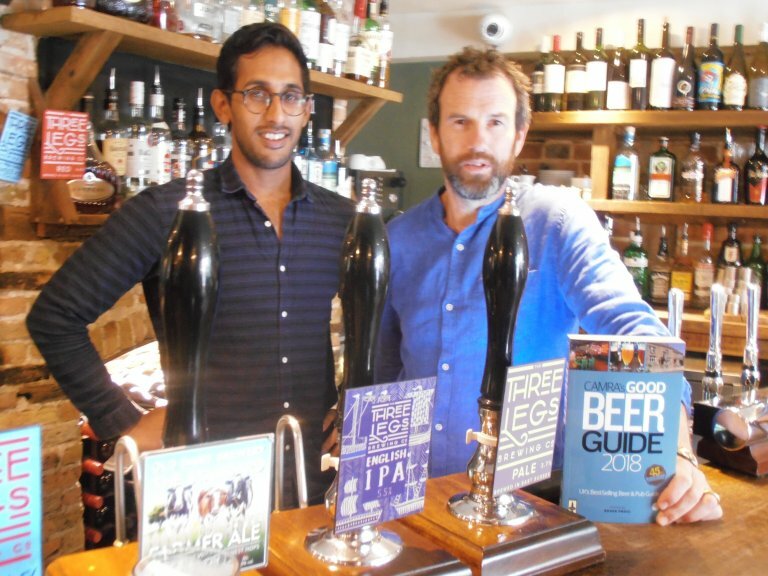 With the publication of the 2018 Good Beer Guide, the Dew Drop Inn, close to Eastbourne’s town centre in Little Chelsea celebrated ten consecutive years in the Guide. This pub has also a notable tale from the 2009 National CAMRA Members’ Weekend, as landlady Shoes Simes’s efforts to get extra handpumps installed in time for the event soon led to word getting round the members about the beer provision being much greater than published in the Guide. This led to so many flooding into the pub that for nearly an hour not a single lager was sold, there was no room for fans of that drink. 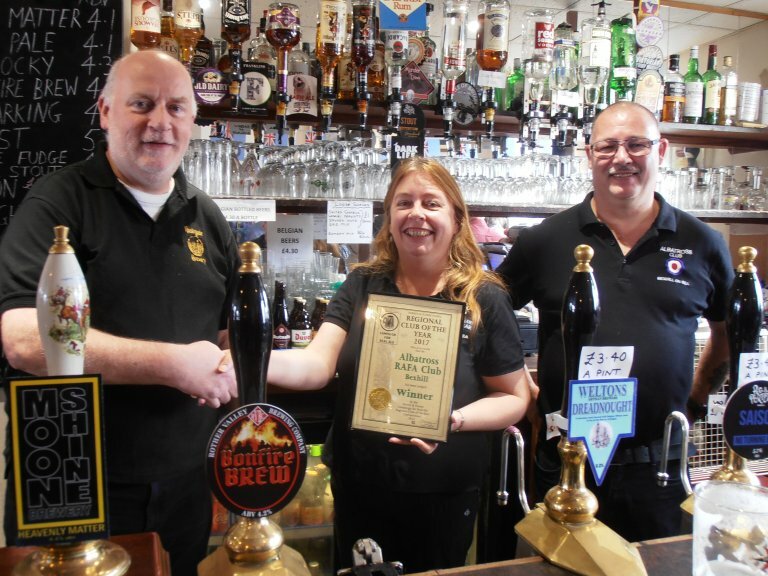 At the award Shoes paid tribute to the support CAMRA had given her as and since she opened her two pubs and said that inclusion in the Guide was an important part of this. 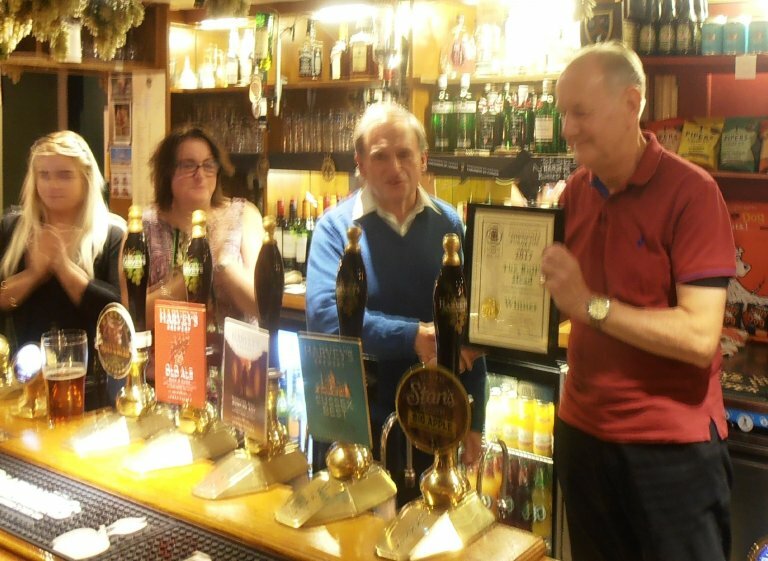 The pictures show, in Septenber 2017, Shoes accepting the award and her staff and CAMRA members crowded behind the bar. 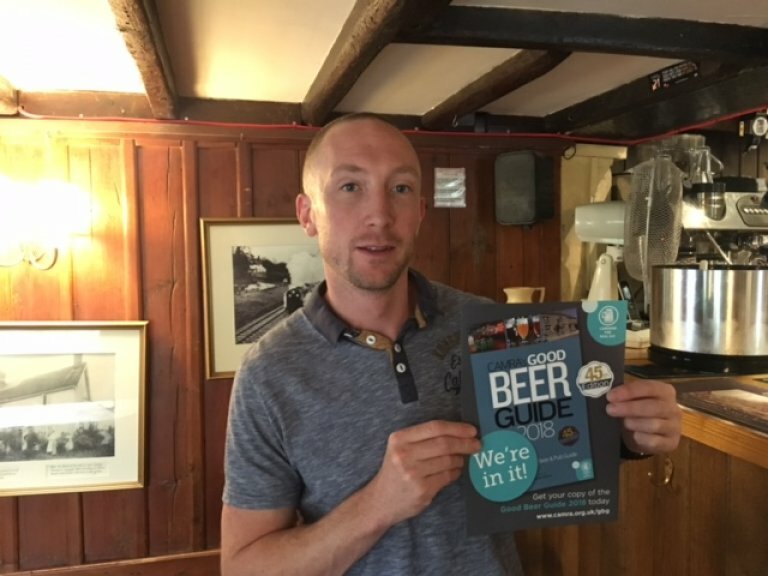 All the places in the Good Beer Guide are important awards and most are much appreciated by those who run pubs, but some are particularly noteworthy. Apart from the anniversaries mentioned above, these include those pubs which are new entrants to the Guide either for some time, or for the first time for new proprietors, or for some the first time ever. This year there were two pubs in the latter category. The Owl at Camber makes its début. Friendly licensees, Madeleine and Peter are seen here, in September 2017, with Dave Platt, branch member, on the left. Set behind the iconic dunes of Camber's sandy beach, the pub offers meals, local microbrewery ales and accommodation. 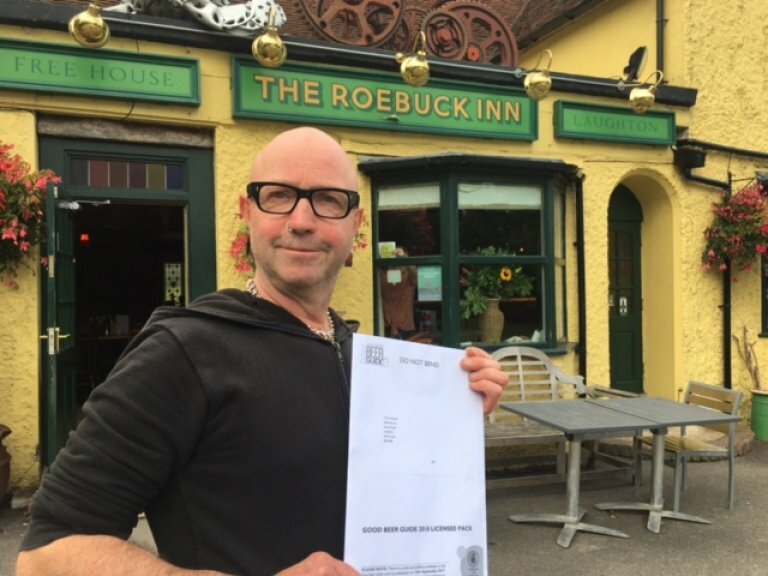 The Roebuck Inn in Laughton, a 17th century free house, was re-opened by Dominic McCartan (pictured in September 2017) and Tony Leonard just two years ago. It's now busy serving quality food and quality ales from nearby breweries, generally Burning Sky, Gun and Harvey's. 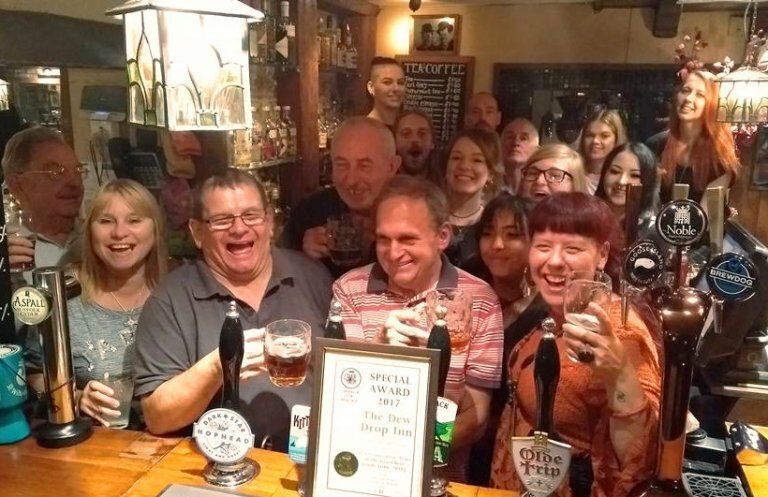 It is not just CAMRA who are impressed as it was named 'best free house in the country' at the John Smith’s Great British Pub Awards, which took place at the Park Lane Hilton in September - despite not being a house selling John Smith's Smooth! Pubs making a return to the guide include the aforementioned Standard in Rye, but also four others. Three of them are tied Harvey’s pubs, the fourth chooses to sell exclusively Harvey’s ales. One of the oldest pubs in England, the Lamb in Eastbourne's Old Town returns to the guide after an absence of seven years. It made its first appearance in 1976 and featured every year in the 1990s. Now a Harvey's of Lewes managed house its history dates back to when it was originally a clergy house as part of the development of the church then called St Michael's. Now the pub has three bar and dining areas, provides lunchtime and evening meals as well as bed and breakfast. Upstairs the sizeable function room often stages Fringe Theatre productions. 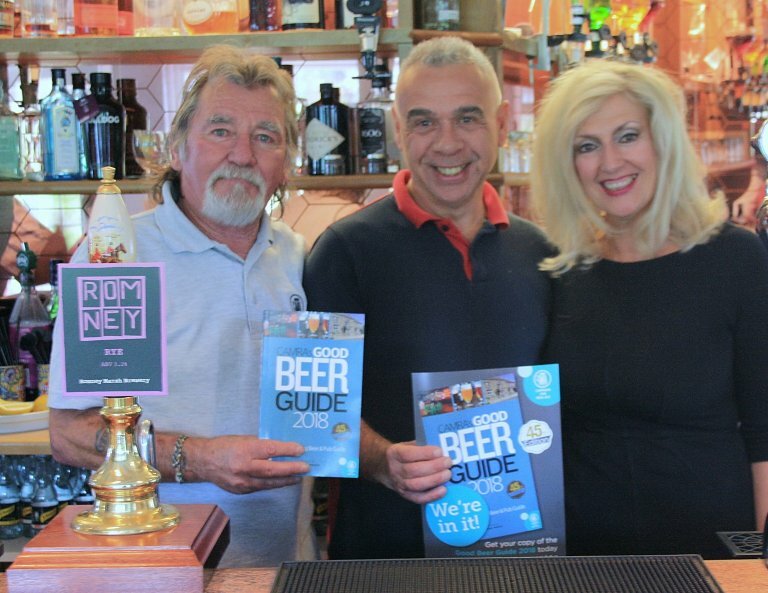 In the photo manager Natalie and her partner John, who takes care of the beers, are with CAMRA member Ian Robertson on publication day in September 2017. Adrian and Annabelle, tenants at another Eastbourne Harvey's house, the Hurst Arms, Willingdon Road, are delighted their pub regained a GBG entry. It was last listed in 2012 under the previous tenants. In the photo Adrian (left) is receiving his GBG notification from Branch Chair Peter Adams in September 2017. The Hurst is a good place to find Harvey's seasonal brews, like Bonfire Boy for November, for a very reasonable price. 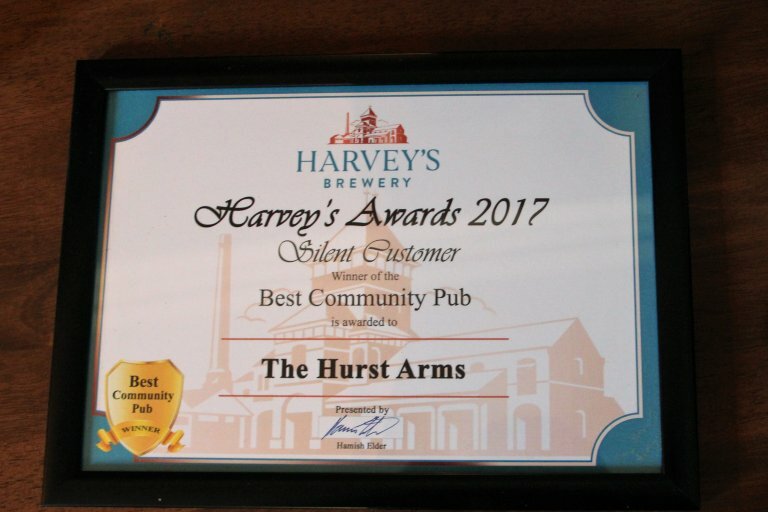 They were also delighted to be awarded Harvey’s own award in a ‘Silent Customer’ scheme as ‘Best Community Pub’ in the brewery’s estate, the award is also pictured. Pete Randall, pictured in November 2017, runs the Wheatsheaf, in the Jarvis Brook area of Crowborough with his wife Becky. It has been in the Guide most years in the last decade, just missing out last year, but re-enters again for 2018. 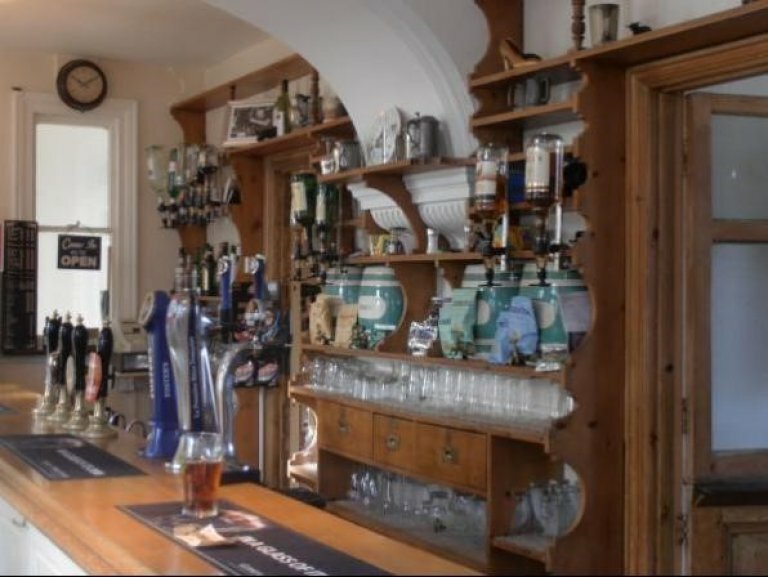 They offer great home cooked food and a wide selection of real ales from Harvey's. Do not miss their famous New Year's Day party! The New Inn, in the village of Hadlow Down is just as deserving of congratulations. It is back in the Guide for the first time in eighteen years and is unusual for being a rural pub not serving food. The virtually unchanged Victorian pub is included on CAMRA's national inventory of Historic Pub Interiors. In October the Albatross RAFA Club, Bexhill, was once again voted the Branch Club of the Year. This has become somewhat a regular event with the Albatross winning the national competition and making the top four in previous years. At the time of the presentation it was known that the club had won the Sussex competition and the Regional competition, but it was decided to make those presentations at a time when people from beyond the branch borders would be visiting the club. This took place later in October 2017 and the pictures show the Branch Chair, Area Organiser and Regional Director Chris Stringer making their respective awards. Accepting the awards are Karen, the head steward of the club, and her deputy Peter. 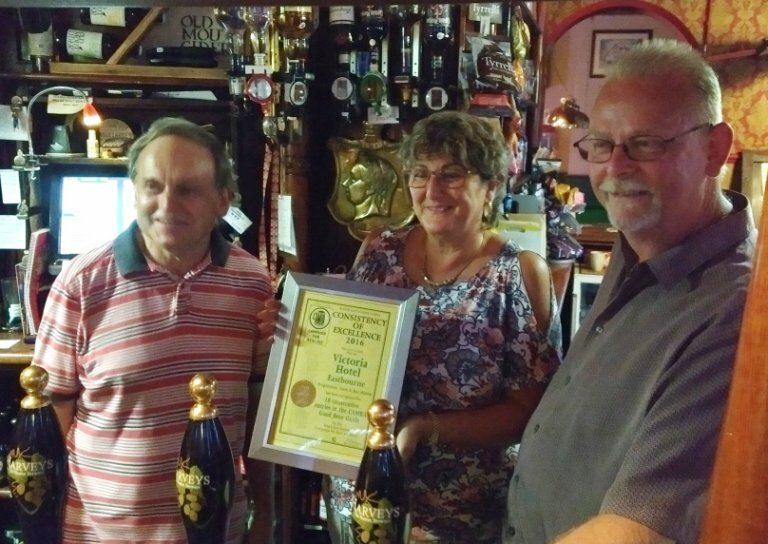 Despite past awards filling up the walls, Karen said that she did not take any of them for granted and that the continued appreciation of the club, now up to five handpumps, by CAMRA was very important to them. 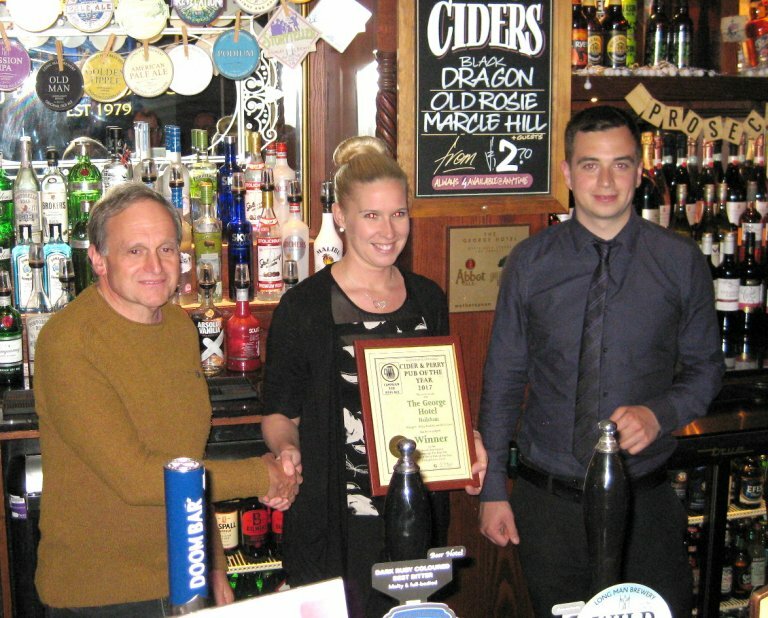 In October 2017 the Bull’s Head in Boreham Street was presented with the Branch Community Pub of the Year. 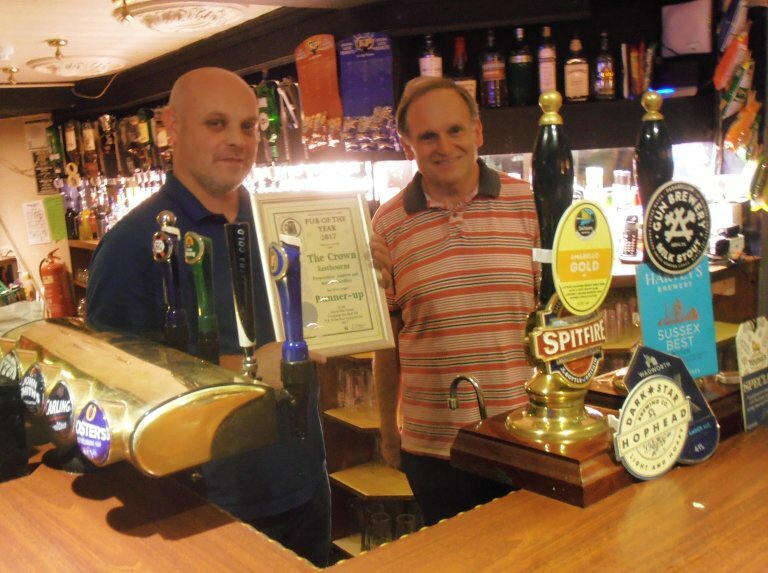 Landlord Mike, pictured behind his bar receiving his award, much appreciated this second CAMRA award for the pub. Along with CAMRA, Harvey’s values the work Mike and his staff do in their original tied pub, but which being in a thinly populated area has meant previous landlords have had less success. Mike has placed the pub at the centre of its community and this has generated a loyal bunch of regulars, while the pub’s reputation in the wider area and its campsite have brought the essential extra custom it needs. November 2017 brought an event which was both sad and celebratory at the same time. 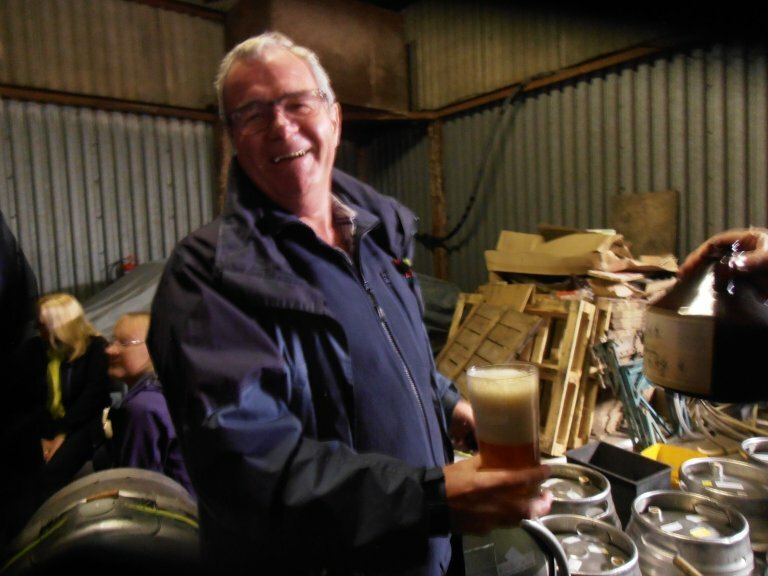 After eleven successful years, Roger of the Beachy Head Brewery decided to retire from brewing and in the event has closed the brewery. Fittingly the punters at the Eastbourne Beer Festival the month before voted his beer, Legless Rambler, the overall Beer of the Festival 2017. At the brewery in East Dean at a farewell drink of the award winning beer, invited guests and CAMRA members toasted the brewery and the festival award. 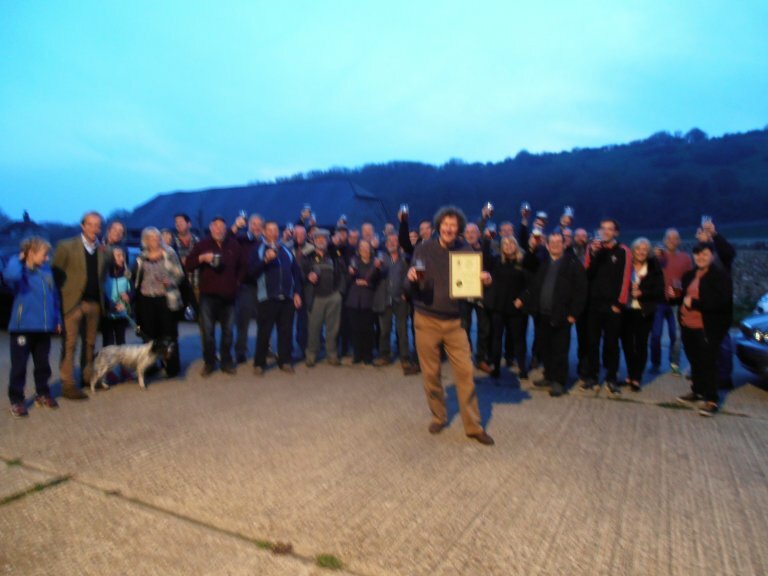 The pictures shows Roger outside the now closed brewery, celebrating his award in front of his guests and the Branch Treasurer showing how to pour a half pint. Because the Branch Pub of the Year was awarded to a town pub, the Branch votes for a second award to a country establishment. 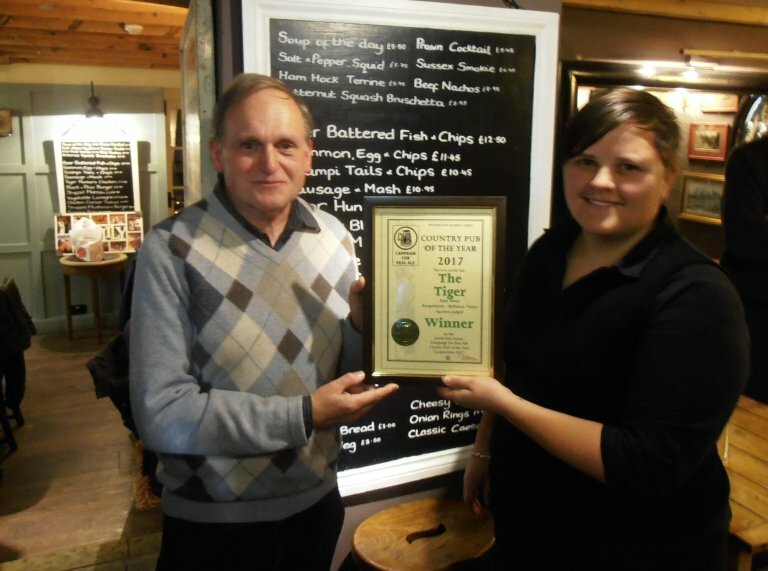 Just down the road from the Beachy Head Brewery is its ex brewery tap, the Tiger Inn which is the 2017 recipient of the Branch Rural Pub of the Year. This was awarded at the end of November 2017, the second consecutive year in which this award has been made to the proprietor Rebecca Vasey. The pub offers a selection of six ales from local breweries, from further in Sussex and beyond. Its attractive location in the coastal area of the South Downs and particularly on the corner of the peaceful East Dean village green makes it popular with walkers and car drivers alike. 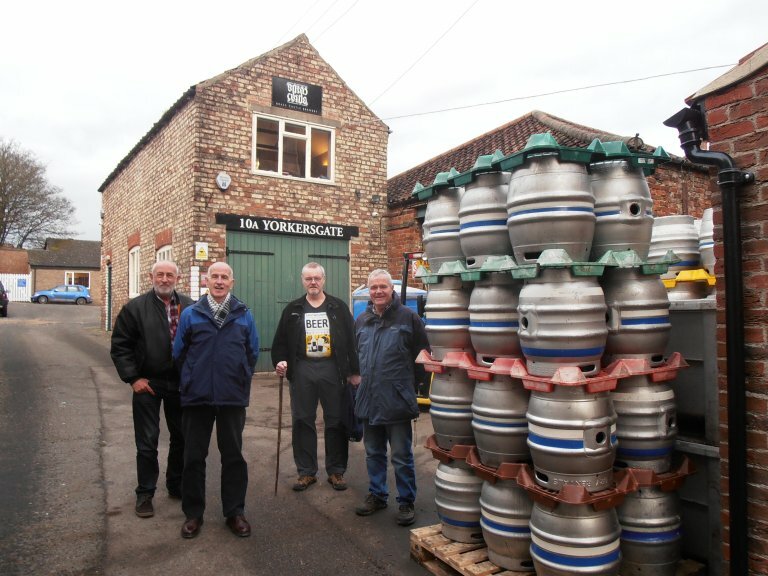 Finally in 2017 there were beer festival brewery awards to be made to Brass Castle in Malton near York and Oakham in Peterborough which were made in early December 2017 by a group of five branch members. Originating from different areas of the branch, they met up at King’s Cross for the midday train to York and after checking in at their B & B continued on the short journey to Malton. 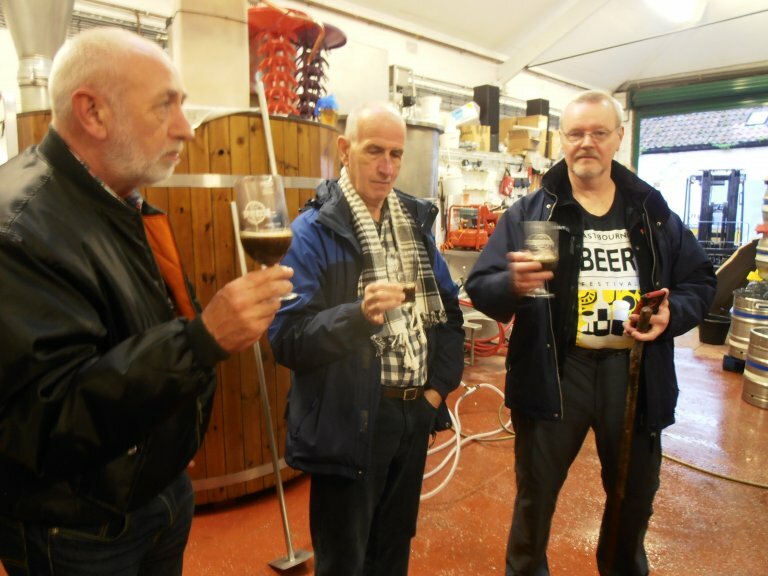 We had a warm welcome from director Phil, operations manager Kev and head brewer Alan. 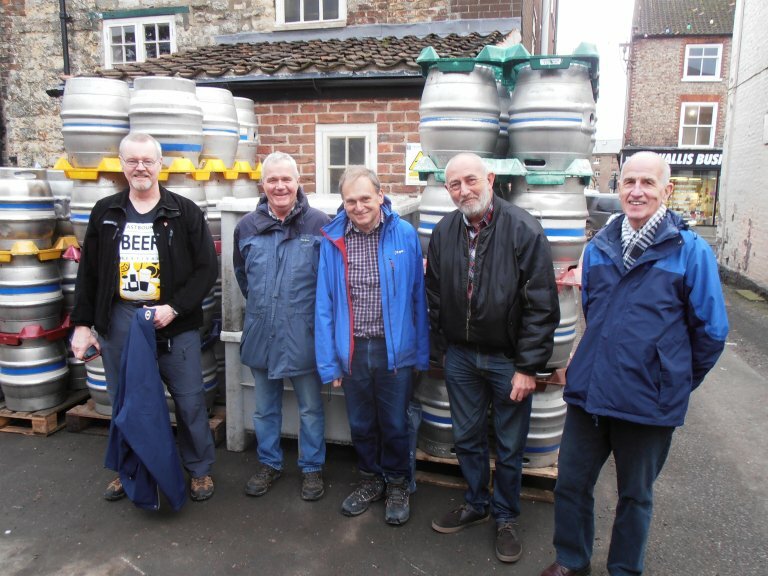 The brewery is a short walk from Malton station; the first two pictures show the group outside it. 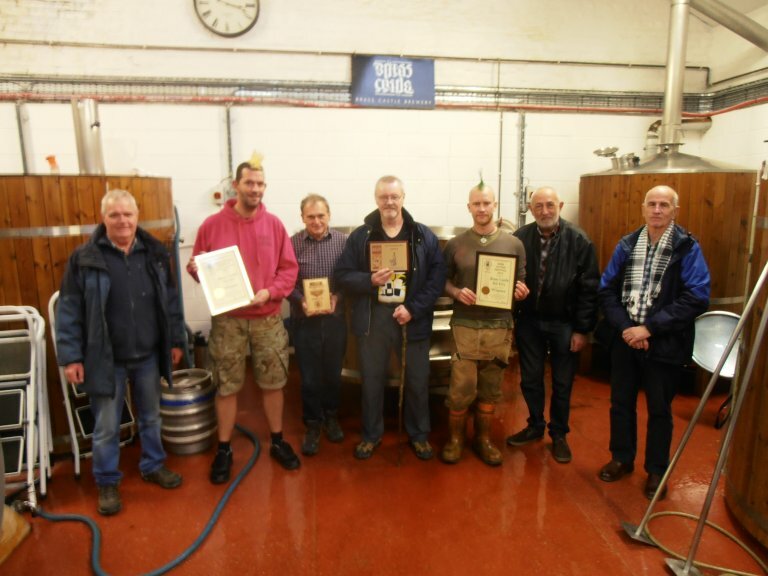 Brass Castle’s dark beer Bad Kitty won the Beer of the Festival award at Eastbourne 2016 in its debut year at the festival, following this up with the Beer of the Festival (Sussex Exemption) in 2017, picture 3 shows our group with Kev and Alan and the awards and picture 4 Kev and Alan in their brewery. 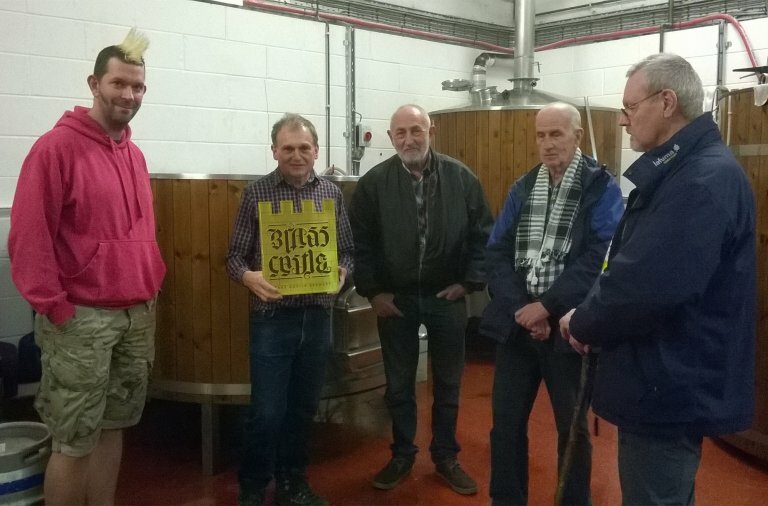 We were given an opportunity to check the quality of Bad Kitting being brewed, (keep it steady Howard), before Kev awarded us one of Brass Castle’s signature emblem plaques for making the journey up to Yorkshire. Returning to York we spent the evening exploring the city centre’s best pubs before turning into our B & B. 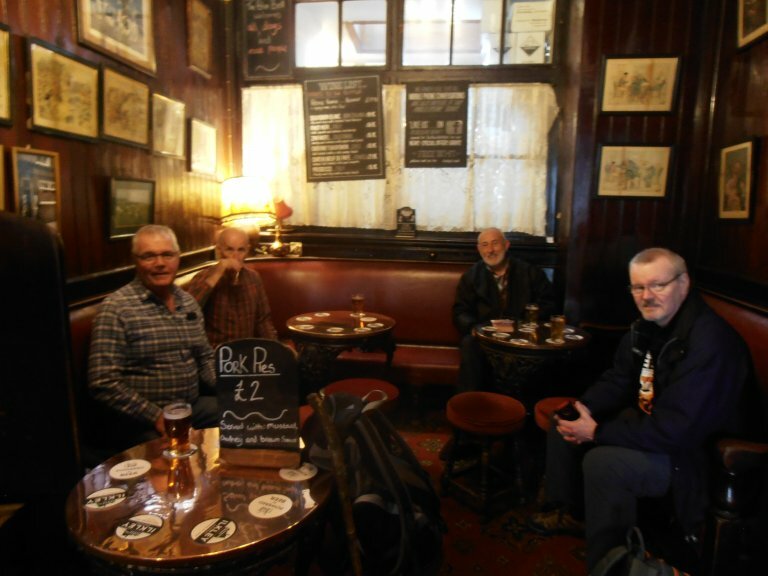 After a late breakfast the next morning there was time to return to our favourite York pub of the night before, the Blue Bell for excellent beer and pork pies, a small pub with a fascinating history, where we were again warmly welcomed by the proprietor. A late running train south meant that we had more time in the York Tap at the station than was expected, but also made us late for our next appointment, to meet Nigel, the marketing manager at Oakham Brewery, Peterborough to present the Eastbourne Beer of the Festival (Sussex Exemption) award from 2016 for Green Devil IPA. We had been due to meet him in the Brewery Tap, near the station, but being nearly an hour late meant that Nigel had had to move on to his next appointment, so the manager of the pub accepted the award on his behalf. That being completed, it was a train to London, from where we dispersed back to our home towns.